"Demons, I get. People are crazy." Aliana doesn't remember ever having a family. She vaguely remembers living on the streets of Rifts Earth Russia as a child, until she was kidnapped and sold in one of the dimensional slave markets. Bought by a demonic Shifter, she grew up a slave in his household but a knack for the Arcane let her learn magic under her master's nose. Cutting deals and making promises, Aliana managed to acquire the runesword Voidsteel Reaper and with it defeat her demonic master and flee. In the years since, she's worked to pay off the debts incurred to do so... only at the cost of further debs. Aliana has sold pieces of herself for the power she commands, and it's left a mark. Laughing at the world helps to keep her from obsessing over just how much she's lost. Compel: When someone is ill-disposed towards her because she works with demons. When her demonic tendencies come up. Everything has its price. Especially the mysteries of magic. It's not surprising that Aliana is heavily in debt, and the price could be her soul. Invoke: To run across someone that owes Aliana. Compel: When Aliana owes someone something from a deal made in the past. Aliana made Promises to get her hands on the Runesword named Voidsteel Reaper, selling more than a little of her soul in exchange for power. 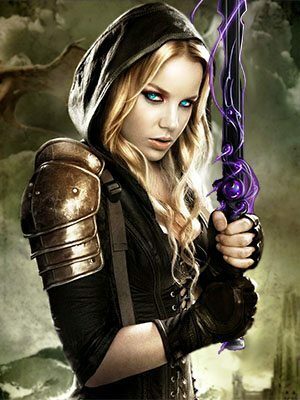 Invoke: Aliana can Invoke this aspect when using the runesword, when someone recognize it as a runesword, or when dealing with the Powers she's made promises to. Compel: Selling a piece of her soul means Aliana is more likely to do things that are selfish or self-serving. And enjoy them. The Reaper itself can also tempt Aliana towards truly Evil acts. Aliana is territorial, and when something is hers (or she thinks it is), she can be stalwart in holding it. Be it objects, lands, or even people. Invoke: Aliana gets a bonus to hold things she believes are hers. Compel: If Aliana perceives that someone is trying to take something that is hers, she can respond viciously. When you spend a lot of time dealing with demons, you learn to be careful of what you say and hold to your word. Invoke: Aliana is good at bending the truth just shy of breaking it and being very precise in what she agrees to or promises. Compel: Aliana will avoid outright lying and hold true to any promises she makes. Aliana is changing both physically and metaphysically to be more like a demon. This gives her an extra Mild Consequence slot and a +4 stress box. Character can use Lore for Occult knowledge. +2 to defend against Provoke attacks specifically related to intimidation and fear. Aliana returns and heads into Vanished Point to seek out Dante. Of course, it's not that easy. Stopped by an intelligent demon and getting past it, the group finds out they were followed ... K'nert ran their tail off though. Aidens lines act up and Aliana invesigates. In Kaths temple, a Shifter, a Psychic and a Mystic are confronted by incense and a minotaur. Having procured a sufficient quantity of wine, Aiden; Aliana and Slaine head off to find Kath. They meet some Wolfen to begin with. With the decision to move made, Aliana ... moves Aiden and herself, along with a stowaway. Aliana receives an invitation to return Aiden to the fighting pits. They decide it's time to move. Aliana and Aiden return to Vanished Point to find Aliana's concerned brother. Good help is hard to find, and that's not the only thing. Slaine has an... episode whilst Aiden and Aliana are present. What happens when a Shifter meets a brother she can't remember? Aiden fights in the gladiatorial pits in Splynn while Aliana follows his trail and plans his rescue. Sort of. Now back from Atlantis, Aiden and Aliana both have to deal with the fallout of his capture and the circumstances of his rescue. In the clutches of the half demon, Chenan, Aiden's situation goes from bad to worse. Returning to Sarens Rest, Aiden meets up with Aliana and Slaine and ... detects something nearby. Looking into the power drains, being at the Power Pyramid at the time of a celestial conjunction proves beneficial. Aliana has a dream that, oddly, Aiden is able to sense. Leo meets up with an old friend over coffee and he's not to happy about it. Aiden is awakened by a cold-nosed wolf and a self satisfied shifter. Is it Joggle or Tamtam? An albino sasquatch was sighted at a power outage near the docks. A power outage that wasn't scheduled and wasn't reported on ... interesting? Aliana goes in search of a pocket dimension where something might be hidden. Aiden and Slaine run interference. Aiden noticed a couple of things when Aliana was confronted by Davin. He finally finds some time to ask about them. Leo claims his favor from the Thirty and others help out retrieving the goods. Aiden, Slaine and Aliana babysit a held up shipment of Dimension Stone. Things go downhill from there. Aliana finds a handbill advertising for a special kind of work: Babysitting rocks. Aiden has made a very, very unfortunate discovery. Aliana happens by while he's mulling it over. Aliana joins Aiden and Slaine and gets them back to Vesper and Kailastia drops some unwanted information. Aliana seeks out a technowizard to help with protecting Smoke. The deputies in Vesper seem to be searching for something. Or is it someone? A group of adventurers discuss how they might find the missing leyline taps. Rethen Shan, one of the techno wizards responsible for Vespers' leyline driven power, is missing and along with him some leyline taps. Kailastia announces a reward. A chance meeting on the docks down in Vesper where Aiden meets up with an old friend. A Shifter, A Psychic and A Mystic meet the in marketplace... it sounds like the start of a joke but it's not. Aliana, Aiden and Slaine meet for the first time on a job. Which involves tentacles ... lots of them.